The ruling conservative coalition of the Fidesz and KDNP parties under Prime Minister Viktor Orbán has repeatedly taken actions that led to confrontations with the EU commission and its EU peers (e.g. a controversial media law, some constitutional amendments curbing the independence of the judiciary, and a tough stance in the migrant policy, together with a lack of willingness to accept the mandatory quotas for refugees passed by the EU. Together with some unorthodox economic policy decisions like additional taxes on banks, the government’s repeated confrontations with the EU have led to some uncertainty among its European peers and international investors. 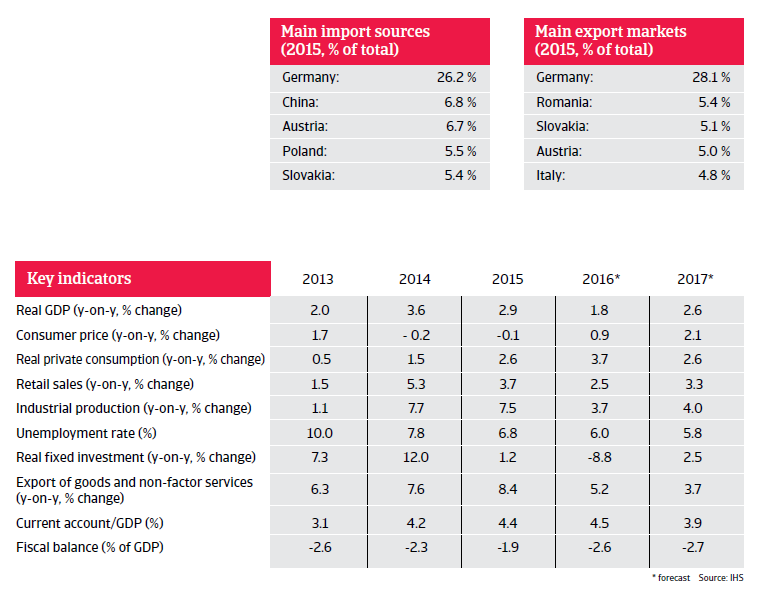 Hungary´s GDP growth is expected to slow down to 1.8% in 2016, mainly due to lower public investment (lower disbursement of EU funds). That said, economic growth is sustained by increasing private consumption (up 3.7%). Household consumption growth is driven by wage increases, lower taxes and lower unemployment (down to 6% in 2016). The rising employment rate is mainly due to hiring in the private sector and expanding public work schemes. In 2016 export growth is expected to slow down, but still remains robust (up 5.2%). The current account is expected to remain in surplus in 2016 and 2017. 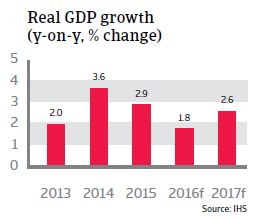 In 2017, growth is forecast to increase by 2.6% as private and public investments will pick up again, while private consumption remains solid. Risks stem from the eurozone rebound coming to an end and a cooling down of world trade, which would hurt Hungarian export growth. In H1 of 2016 the central bank of Hungary decreased the benchmark interest rate twice, to 0.9% in July 2016, in order to counter decelerating inflation and to spur economic growth. After deflations in 2014 and 2015, (mainly due to regulated household energy prices) consumer prices are expected to grow again, by 0.9% in 2016 and 2.1% in 2017. The government has proven committed to fiscal discipline so far. Containing the budget deficit within 3% of GDP is a top priority of the administration in order to avoid EU sanctions. However, since 2010 the government has been using unorthodox ways to balance the budget, most notably extraordinary taxes on banks and utilities. The budget deficit is forecast to remain below the 3% threshold in 2016 (2.6% of GDP) and 2017 (2.7% of GDP). 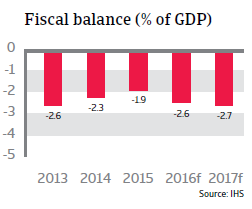 Hungary’s major weakness remains its high level of external debt of more than 100% of GDP in 2015. A large share of it is foreign currency denominated, which exacerbates the problem, as a weak forint hurts many Hungarian households and businesses whose loans are denominated in foreign currencies. 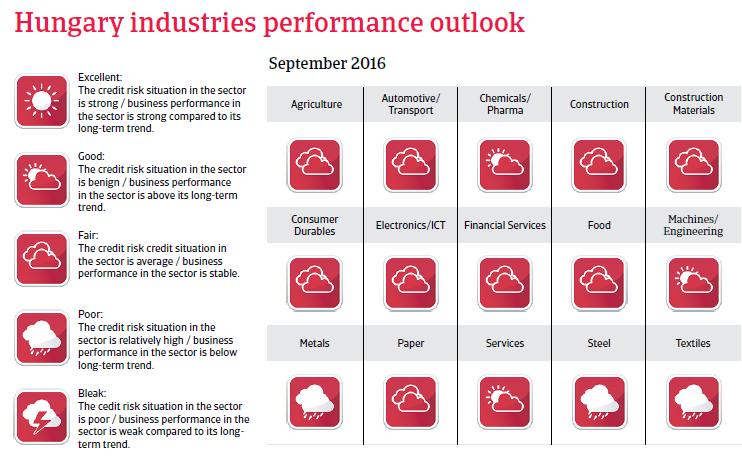 Therefore, Hungary remains highly vulnerable to international investors sentiment and currency volatility.